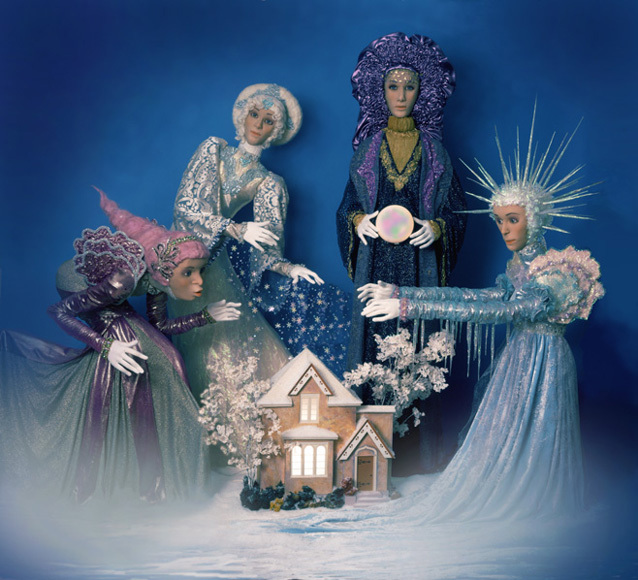 Winter Spirits: life sized mechanical figures of the North Wind, Snow, Darkness, and Ice doing their chilly magic on a little house. 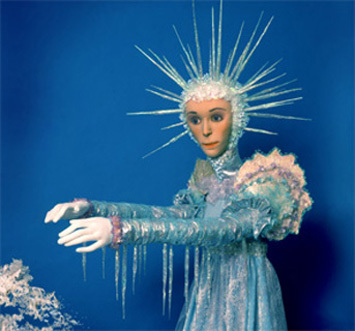 Wind rocks back and forth, blowing on the house, Snow casts flurries, Darkness holds the Moon, which glows and changes colors, and Ice waves her icicle laden arms, freezing the landscape into frost patterns. 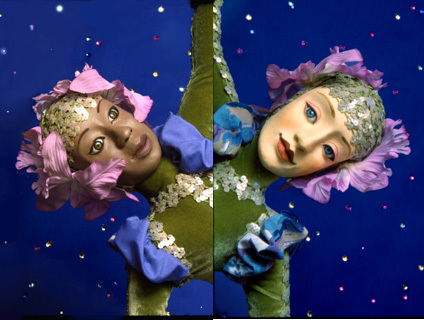 Masked Ball: mechanical display based on Venetian Carnival and other midwinter celebrations. The Masked Lady removes a happy brightly painted face to reveal the shy pale Wallflower beneath, the male Dancer twirls the female Dancer who surprises us by becoming a completely different person as she rotates (Black lady, White Lady), while the Turkish Prince bows, and little Cupid seeks a likely target for his arrows. 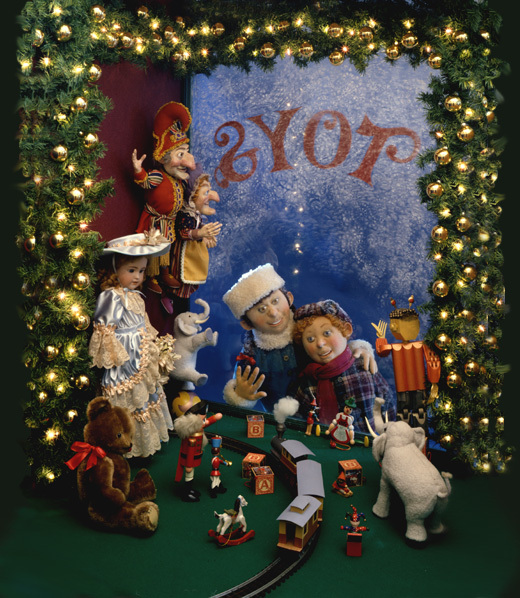 Left Toys' Tea Party: T'is the night before Christmas, and the toys in the nursery await the coming of Santa to bring them new companions. 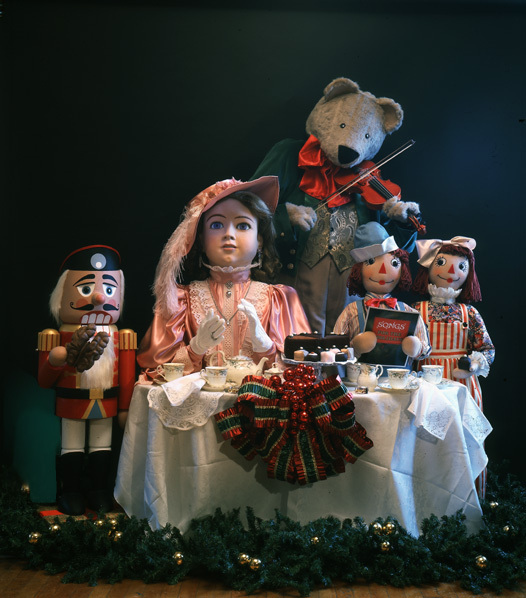 Raggedy Ann and Andy sing carols, the porcelain Lady Doll claps her hands in accompaniment, the giant Teddy Bear plays his fiddle, and the Nutcracker chows down on a giant walnut. 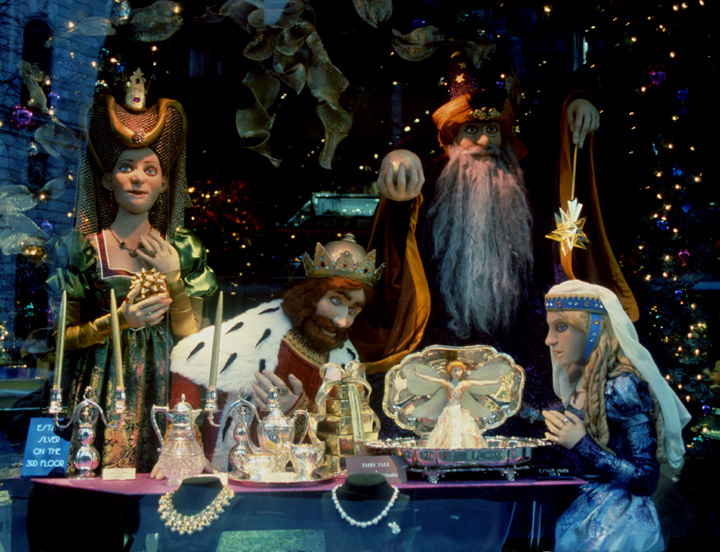 Right Children at a Toy Store Window: brother and sister enchanted by the gorgeous display, and hoping to find some of these wonders under the tree on the morrow. 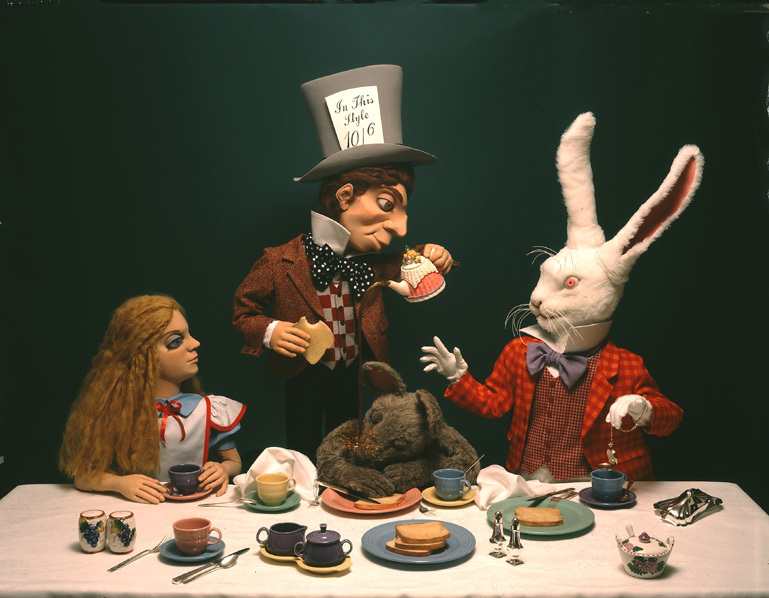 Mad Tea Party from Alice in Wonderland: Mechanical display based on the Tenniel illustrations; as Alice looks on in amazement, the mad Hatter pours tea on the sleeping Doormouse, who wakes with a start at intervals, then dozes again; and the March Hare dips his watch in the tea, in an effort to restart it. 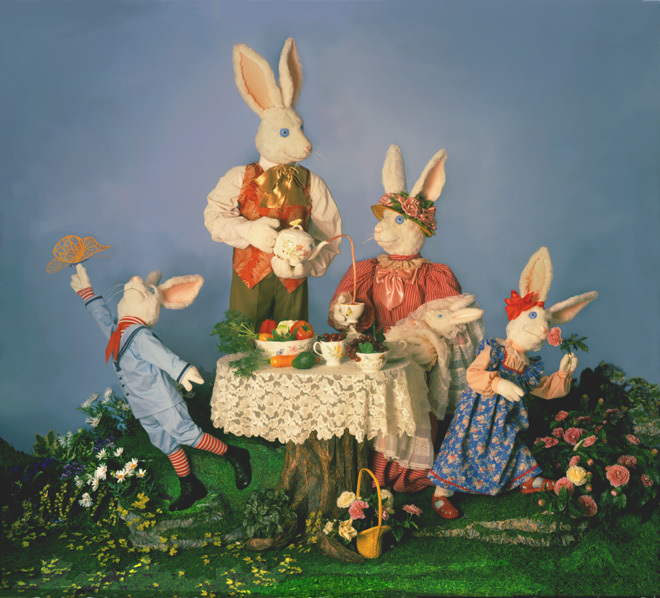 A Fairy Tale: The Royal Family at Christmas dinner, enjoying their presents. 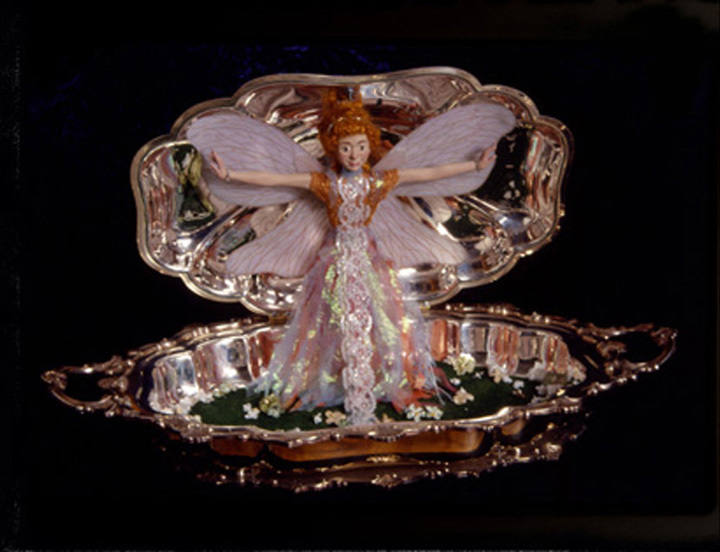 The Queen has received a set of emerald jewelry, but the Princess has gotten the most charming gift of all, a fairy inside a silver chafing dish! 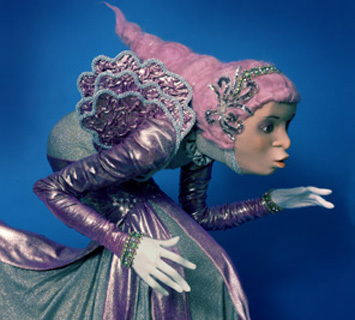 Bewitched by the Palace Wizard, the Fairy must dance for the Princess. 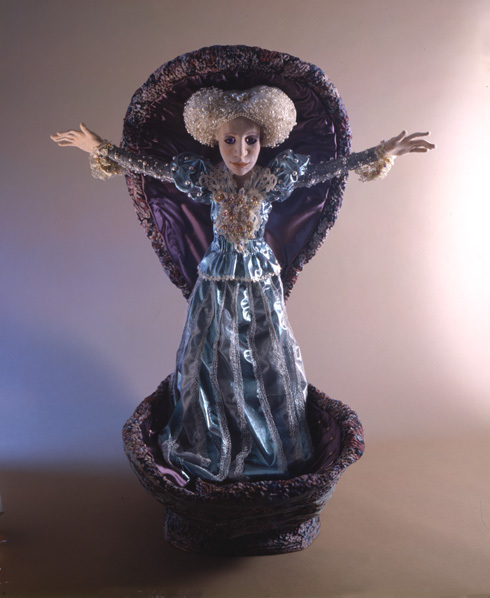 when the lid of the dish opens, the Fairy rises, raises her arms, then her wings rise and flutter. As the lid closes, her wings drip, then her arms, then she does a deep curtsey and folds herself up into the closed dish. 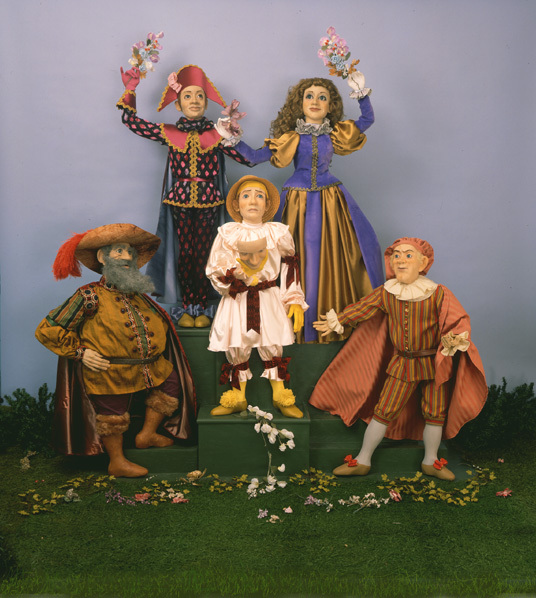 Commedia del'Arte: mechanical display commemorating a sale of Italian jewelry. 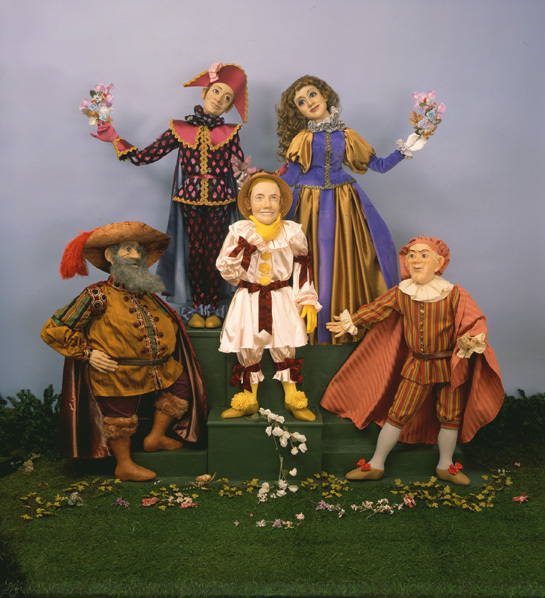 The traditional itinerant players perform their show; Harlequin and Columbine dance, Pagliacci removes a happy face mask to show his real tearful expression, Other comical characters look on. 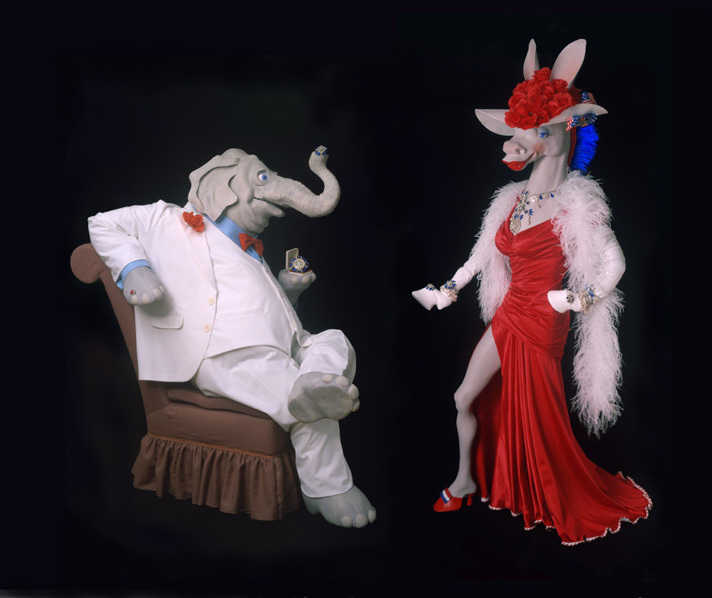 Welcome to the Republican National Convention: Here, Republican Elephant and Democratic Donkey are friends, brought together by their love of Fortunoff's jewelry. The Elephant offers, with paw and trunk both, sapphire and diamond brooches to the already much bejeweled Donkey, who is sexily gussied up in tight dress, high heeled hooves, and flamboyant hat. Perceptible in these figures is my own cynical comment on the similarity between the parties, their go-along-to-get-along alliances, and their interest in wealth. 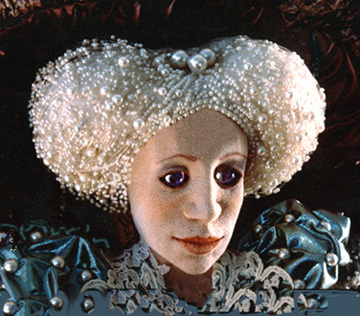 Pearl, the Oyster Princess: mechanical display done as a pearl window. 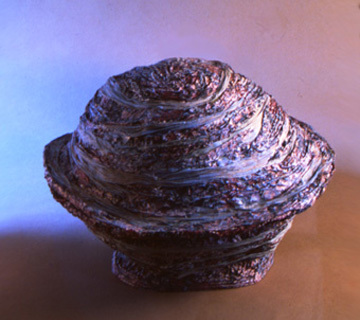 Pearl lives in a giant oyster shell. When it opens, she rises, and raises her arms. 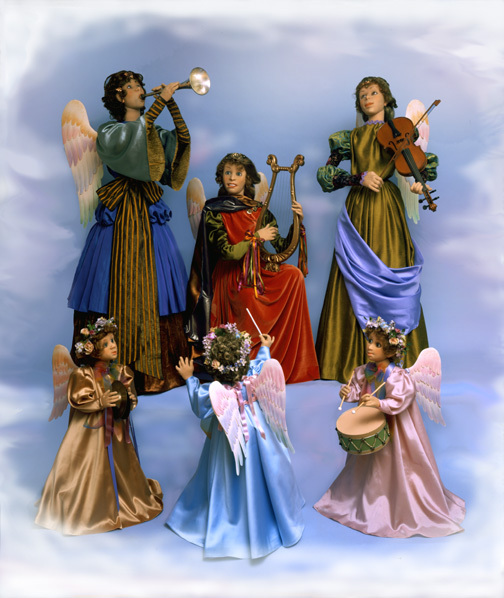 Celestial Sextet: mechanical display of musical angels and cherubs playing holiday music. 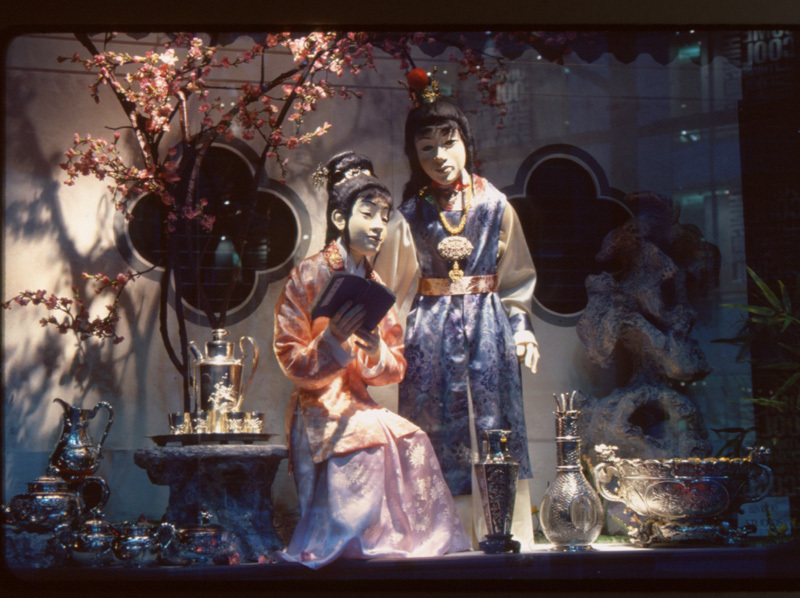 Dream of the Red Chamber: Display window showing the principal characters of China's earliest novel, a Song Dynasty story of an ill-fated and tragic love affair between two young aristocrats, the Lady Lin Tai-Yu and Jia Pao-Yu, scion of a rich and influential family. 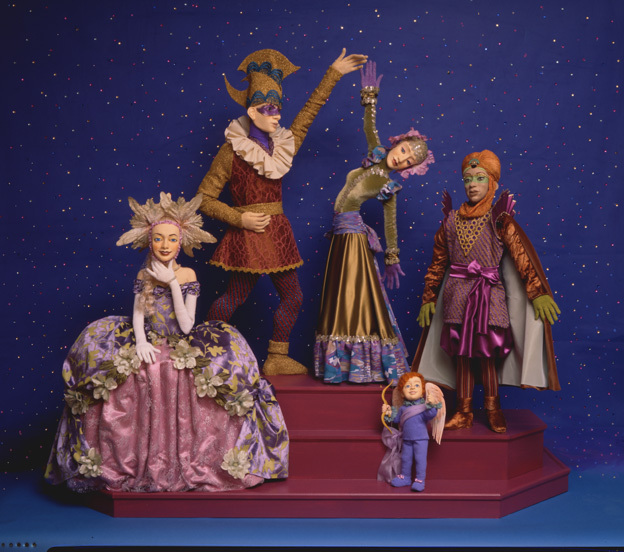 Figures are 2/3 life size, figures and garden created to promote the store's current sale of Chinese wares.